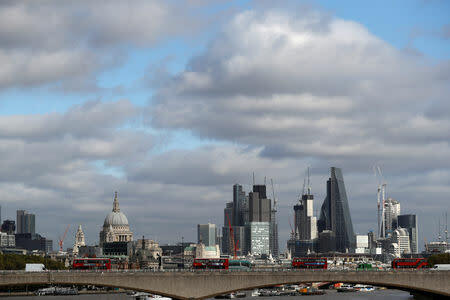 LONDON (Reuters) - Britain's economy slowed sharply in late 2018, pushing annual growth to a six-year low as worries about Brexit hammered business investment and a weakening global economy weighed on trade, data showed on Monday. "Brexit uncertainty, a slowing global economy and the persistent financial squeeze on consumers and businesses (are) increasingly having a suffocating effect on economic activity," British Chambers of Commerce economist Suren Thiru said. Monday's data showed a net trade deficit lopped more than 0.1 percentage points from Britain's fourth-quarter growth rate. Falling business investment did similar damage. Chancellor Philip Hammond said the data showed the economy remained "fundamentally strong" and that Britain's Office for Budget Responsibility did not foresee a recession.